A SPIRITED performance gave new boss Jim Duffy his second home win and moved his side up to eighth in League One. A SPIRITED performance gave new boss Jim Duffy his second home win and moved his side up to eighth in League One in front of a 607 crowd at the C & G Systems Stadium. The home side were on top for much of the opening half hour, though some sharp goalkeeping and defending was also needed by Dumbarton at the other end on a couple of occasions. On 19 minutes Sons were in front. A shot from Dom Thomas was blocked by a hand in the penalty area. Ross Forbes stepped up for the spot kick and slotted in to make it 1-0. The men from the Rock strained to add to the score for the next ten minutes. But then a mix-up at the back cost them dear. On 31 minutes on loan keeper Chris Smith failed to deal with a cross and Cammy Ballantyne brought down his man when going for the loose ball. Mark McGuigan stroked home the resulting penalty to level the game at 1-1. Dumbarton kept the attacking energy going after the break, and on 56 minutes Thomas gave Sons a 2-1 lead with a wonder strike from 25 yards into the top corner. 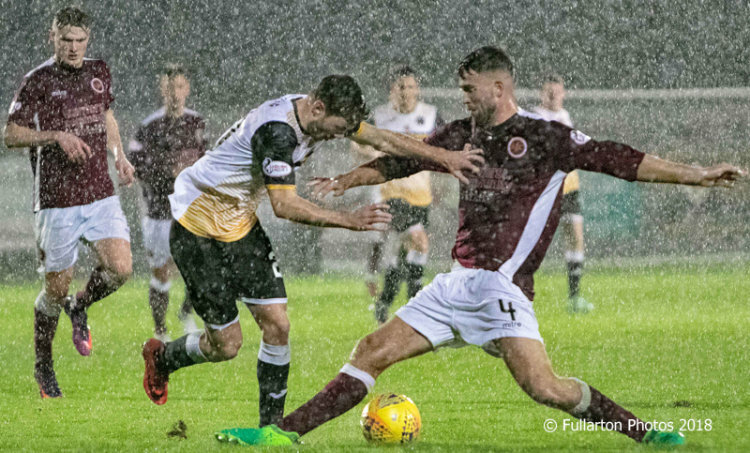 As the heavens opened with sheets of rain (pictured) Stenhousemuir pressed hard to come back into the match, but Sons defended stoutly. On 84 minutes it looked as if McGuigan had squeezed the visitors level, but Forbes recovered brilliantly to hook the ball off the line. Dumbarton hung on tenaciously in the final minutes to register an important win.